American sushi expert Marisa Baggett has been working passionately for years to perfect sushi recipes that take full advantage of the freshest garden vegetables, herbs, tofu, mushrooms and spices available at your local farmer's market or co-op. Her innovative use of sustainable ingredients like fresh asparagus, apple, daikon radish, basil, tomatoes, beets, corn, shiitake mushrooms and cucumbers set her sushi recipes apart from all others you may have seen. Marisa starts by giving surefire recipes for making perfect sushi rice every time. She provides tips on which vegetables work best with sushi rice and how to create original combinations. 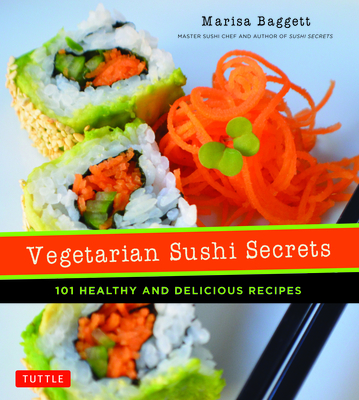 Vegetarian Sushi Secrets is a gem of a Sushi cookbook that shows you how to make foolproof thin rolls, thick rolls, inside-out rolls, hand rolls, bowl rice sushi and much more in no time at all. Marisa Baggett arrived in Los Angeles from her home in Mississippi with one goal in mind: to learn as much as she could about great sushi. At the California Sushi Academy, she studied sushi preparation, sushi culture and how to make other Japanese dishes. She became the school's first black female graduate and returned to her Southern home to share her "Southern-style sushi." She teaches workshops on sushi making, caters sushi events, and works with caterers in the Memphis Jewish community to supply kosher sushi for special events. She is the author of Sushi Secrets: Easy Recipes for the Home Cook. Husband-and-wife team Justin Fox Burks and Amy Lawrence are the authors of The Southern Vegetarian: 100 Down-Home Recipes for the Modern Table. In 2014, Burks and Lawrence were invited to speak at the venerable James Beard House in New York City for the "Enlightened Eaters" series. Justin, Amy, and their recipes have been highlighted in The New York Times, The Washington Post, Woman's Day, The Kitchen, Local Palate, The Huffington Post, P. Allen Smith's Garden Home, Food Network, and Memphis magazine. Justin and Amy write their cooking blog, The Chubby Vegetarian, teach cooking classes, write articles about home cooking, and are developing new recipes for their follow-up cookbook. Allison Day is a dancer, web developer and food writer with a degree in economics and a passion for sushi. Allison lives in Southern California where she produces her Sushi Day blog.